Welcome to The Wade Krout Team! 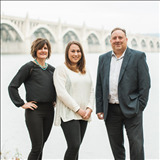 Wade Krout, Jennifer Mackie and Mckenzie Krout are licensed Realtors assisting Buyers and Sellers throughout Central Pennsylvania. Their expertise in the local market and real estate trends make them well-equipped to help any client with their real estate needs. "I highly recommend Wade for anyone interested in buying or selling real estate. He has helped my family with the sale of our previous home and the purchase of our current home. Wade takes time to explain the entire process and both transactions went smoothly. We also had Wade handle the purchase and sale of an investment property. His knowledge and experience with investment real estate were very helpful in these transactions." - Tom L.